The meal started with a huge scallop in a shiitake mushroom sauce. The presentation was really nice, with the little jalapeno and parsley garnish. Salad was the second course. It was an arugula salad with goat cheese, artichoke hearts, and strawberry. These three ingredients aren't something that I would think of to put together in a salad, but it worked really well. The third course was Chilean Sea Bass served Oscar style. Although Chilean sea bass has been one of the top fish to avoid for years according to various seafood watch lists, my conscious didn't hurt too much as I ate this tasty piece of fish topped with crab meat. Next was a Duck and Brie Pot Pie. I've never had duck in pie before, and this was a good one. The duck was nice and tender and lacked the fatty pieces that gives the bird a bad reputation. Finally, it was time for dessert. We ended up having two desserts, the first being a chocolate creme brulee. It was very chocolaty and good. The second dessert, the strawberry fettucini, was definitely the winner. I've never had anything quite like this, and it was delicious. Strips of crepe made up the fettucini, served in a creamy sauce that had a slight cinnamon flavor, then topped with strawberries and walnuts. I love it when restaurants do unique desserts! Oceanside Grille was one of the best meals in a while. I can't remember the last time I've had a fancy multi-course like this. The taste and presentation of the food was wonderful. I got to try some new foods and was introduced to the wonder that is wagyu beef. You should definitely visit Oceanside Grille! I had lunch at the Eau Gallie River Crab House in Melbourne. Located in a repurposed Burger King building, this restaurant has a very nice view of the Eau Gallie River. They have plenty of outdoor seating overlooking the river, but it was very warm on the afternoon we choose to eat there, so our meal occurred in the air conditioning. Although crabs may have been the thing to order here, I instead had the Blackened Mahi. Served with two sides, I choose the onion rings after seeing them be delivered to a nearby table and the steamed vegetables, which turned out to be broccoli. The fish had a nice spicy flavor and was nice and flaky. I don't know if it was meant to go with the fish or the onion rings, but I also liked the honey mustard dipping sauce that was served on the side. Island Pasta Company is located in Downtown Melbourne. They specialize in all sorts of pasta, with many of their dishes having a tropical influence. Osteen Diner is one of the few restaurants in the small town of Osteen, FL. Before a Wal-Mart shopping center opened nearby, the diner was perhaps the only real sit-down restaurant in Osteen. The Osteen Diner is a cross between a classic diner and a Cracker Barrel (only better). It has that porch out front just like a Cracker Barrel, only the Osteen Diner has the southern comfort food chain beat with their chicken coop in the parking lot. The whole restaurant has a southern feel, and this southern theme is also apparent with some of their menu items. I had breakfast on this visit to the Osteen Diner. I kept it simple and ordered two scrambled eggs. I had a choice of grits or home fries as a side, and I went with grits. A biscuit was also served on the side. The eggs and grits both were good, as they should be with a simple dish like I ordered. I've had better biscuits elsewhere though. The Osteen Diner may not be fine dining, but anywhere that has a chicken coop in their parking lot is worth a visit! Mustard's Last Stand is one the more famous restaurants in Downtown Melbourne. The restaurant is a small hot dog stand with some indoor seating and a nice outdoor patio. I had heard countless people talk about Mustard's, and I finally stopped into the restaurant to give them a try. This hot dog stand was decorated with murals of a bearded hot dog and a bottle of mustard in various activities. For a hot dog place, Mustard's Last Stand has a huge menu. I'm not a big fan of normal hot dogs served plain. They are just plain boring to me, but hot dogs get better when they can be dressed up in countless ways. When I got to the restaurant, I found out they have 2 for 1 dogs from 5-8. Since I got to try two, I had a Chicago Dog and a Guac the Dog. The Guac the Dog was topped with guacamole, melted cheese, salsa, and onions on a poppy seed bun. This dog was somewhat messy with all of the saucy toppings dripping out while being eaten. The Chicago Dog had mustard, tomato, onion, pickle, relish, peppers and celery salt on a poppy seed bun. This was definitely the winner out of the two hot dogs that I tried on my visit to Mustard's. Mustard's Last Stand was a fun place. Really unhealthy with their encouragement to eat two hot dogs in one serving, but still tasty with a huge menu as far as hot dogs go. I'd go back! Gyros & More is a Greek/Middle Eastern fast food restaurant that has a couple locations around Melbourne. 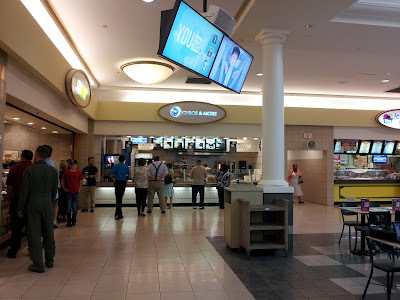 While the other locations are stand alone, potentially the most well known Gyros & More is located in the food court of the Melbourne Square Mall. A few different people each told me to try the falafel at Gyros & More the next time I visited the mall. That visit to the mall food court happened eventually. I followed everyone's recommendation and ordered a falafel sandwich combo, which came with a side and a drink. The sandwiches were made very quickly, and soon enough it was time to eat. 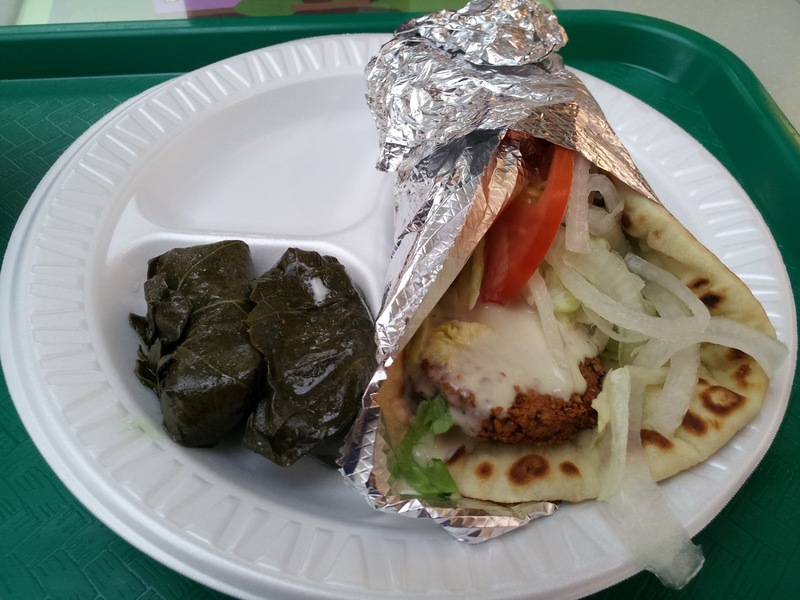 The falafel pita from Gyros & More was decent, but I've definitely found better elsewhere. The pita was filled with falafel, lettuce, onions, tomato, and tahini, but yet I found it to be on the dry side. The sandwich tasted good, but a little more moisture in the pita would have been better. Still good, but not the best. I had stuffed grape leaves as my side. No complaints about these. Although the falafel was a little dry, it was still tasty. This was also way above most of the other choices in the mall food court. I'd get food here again, although next time I think I'll try a gyro. Anthony's Pizzeria is located in Thorton Park, just a block away from Lake Eola. It may or may not be connected to any of the many other Anthony's in Orlando, depending on who you talk to. I've been here several times and I can't remember ever having anything besides pizza. The pizza at Anthony's can be really inconsistent. Sometimes it is really good, yet other times the pizza is average to bad. I guess it all depends on who is cooking on the particular day and their pizza making skills. On my most recent visit, I stopped in for a slice after walking around Lake Eola and exploring some of the surrounding neighborhoods in Thornton Park. It was a good day at Anthony's. The pizza was nice and thin with a good sauce/cheese ratio. The slice was good sized, and most importantly, it tasted good! The Korean BBQ Taco Box was among one of the initial food trucks in Orlando that started the food truck craze that we're in right now. Everyone seemed to love this place, but it took me a while to actually try them. While at the Food Truck Bazaar at Winter Springs High School, I decided to give the Korean BBQ Taco Box another try. I figured I should have their food when it wasn't the discounted bottom of the barrel. This time around, I tried the Spicy Pork Taco Box. The box came with a taco, salad, chicken wing, tempura potato, and a fried cheese roll. This was a huge improvement over my first meal with the Taco Boxes. The taco was filled with spicy shredded pork topped with lettuce. The salad consisted of iceberg lettuce with ginger dressing. The chicken wing was similar to what I had previously, and still good. The cheese roll was interesting too. It was like an egg roll filled with rice and cheese. After my second meal with the Korean BBQ Taco Box Trucks, I am now a fan!